What is vinyl, and what is the difference between PVC and the vinyl used in fences? Crude Oil, Natural Gas, and Salt are the raw materials used to produce Polyvinyl Chloride (PVC) resins. The simplistic term "PVC" can encompass anything from a soft plastic lawn chair to the incredibly strong types used in military armor and by NASA. Southwest Vinyl uses vinyl compounds formulated from premium grade raw materials, which include polyvinyl chloride resin (PVC), UV inhibitors, impact modifiers, stabilizers and toners. SW Vinyl is the only fabricator of "Transferable Lifetime Vinyl" in the Southwestern U.S. Our diverse fabrication expertise encompasses factories such as U.S. Polymers, Kroy, Homeland, Country Estate, National Vinyl, Saint-Gobain, Forest, MFT, Bufftech, Plygem, and US Vinyl--all premier extruders with as many as 60 years producing outdoor vinyl. Using only premium grade raw materials in conjunction with superior technical formulations produces a vinyl product far above industry standards. The basic chemicals used in manufacturing PVC – ethylene and chlorine – are derived from materials nature provides. Ethylene is made from crude oil or natural gas and chlorine is made from salt. These gases are combined to form ethylene dichloride (EDC). The EDC is heated, or cracked, producing two gases: hydrogen chloride (HCl) and vinyl chloride monomer (VCM). Vinyl chloride monomer is the basic building block used in the manufacture of polyvinyl chloride. The term poly means many. PVC is simply many molecules of vinyl chloride monomer. High Density Vinyl Polymer is many layers of these molecular structures. A chemical reaction called polymerization is used to convert VCM into PVC resin. This is accomplished by making VCM react with itself to form a powdery white solid material – PVC resin. Once PVC resin is produced it cannot revert back to VCM. Much like cooking an egg – once cooked, it cannot return to its original, raw state. How is vinyl fence made? Fabrication: A Southwest Vinyl Fence fabricator cuts the wide variety of picket or slat profiles to custom lengths for the desired design. Special notches are then crimped into the picket tops and bottoms. The fabricator then routers individual holes into the rails so the notched pickets can be inserted and locked into place. Posts are then routered to match rail profiles. The various fence components may then be pre-assembled for Quality Assurance or separated for shipping. These carefully crafted, interlocking components are an additional reason why custom vinyl fencing is superior to the "big box," stores. National chains such as Home Depot, Lowes, Harvey, and Direct Buy, have no problem explaining to customers they do not carry, stock, fabricate, resize, or assemble or install vinyl fencing. Their market is to the DIY: Do-It-Yourselfers. Not custom, lifetime vinyl, fence customers. One of the biggest reasons is there's no way for a store to fabricate vinyl components. Nor to create interlockable features. All-in-one stores can only offer prefabricated fence "panels" from a catalog. Pre-fabricated, plastic sections, put together with brackets, glue, screws and fasteners cannot, and are not, meant to last a lifetime. A customer should be encouraged to research the difference. Customers are often surprised that an installed, custom, lifetime, vinyl fence may only cost 10-20% more than buying all the separate components at a chainstore and hiring a contractor to install prefab, plastic, fence sections. What type of Extrusions are used in vinyl fence? Two types of extrusion processes have typically been used in the production of all types of extruded High-Density Vinyl Polymer products, such as Siding, Window & Door frames, Pipe & Fence products: Monolayer and Co-extrusion. A fence buyer should be aware of which of the two methods was used in the material being considered. Some fence extruders produce fencing using pipe specifications. Fencing materials extruded in the same manner as pipe would, by definition, result in less UV stabilization and impact resistance where it is most critical. Monolayer means a single extrusion was used to form the desired profile. As a single layer, all the material ingredients and their characteristics are uniformly dispersed throughout that layer. Co-Extrusion melds two layers of High Density Vinyl Polymers together with a resulting integrity indistinguishable from monolayer: The outer layer, or Cap Stock, is similar in function to human skin and contains a denser concentration of the essential elements, such as UV inhibitors, i.e. TiO2, and molecular binders. The ASTM's "Specification for Rigid PVC Exterior Profiles Used for Fencing" (F 964-94) requires that the cap stock layer be a minimum of 00.015" thick and a maximum of 20% of the overall thickness of the profile wall. It is important for the potential buyer of a High Density Vinyl Polymer fence, deck, or railing system to determine what ASTM specification is being used by the extruder, if in fact any is being used at all, and to ensure that compliance is being verified regularly. The inner layer, or Substrate layer, when produced with virgin raw materials, is essentially the same as the cap stock layer, but with a lowered concentration of UV inhibitors and color pigment. This enables lifetime vinyl extruders to formulate a better, more protective mix of ingredients where they are needed the most. What if my co-extruded fence product has a color difference? One of the popular misconceptions is that a color differential between the cap stock and the substrate layer indicates "recycled" material in the substrate. Just as with the cap stock, a virgin vinyl substrate cannot contain ANY recycled material either. However, virgin vinyl "regrind" is acceptable since it has never been compromised by sunlight or U.V. There is typically less color pigment compound used in virgin substrate which would result in a different hue. Conversely, "reground" substrate material can be made to exactly match cap stock, which would give the false impression the product is mono-extruded. Isn't a co-extruded product inferior? Another misconception is that co-extrusion is somehow inferior to monolayer. Co-extrusion is a more capital-intensive technology offering significant benefit to the consumer by concentrating the essential materials where they do the most good. This gives the consumer a stronger, more durable product, and in turn, more overall value. Claims that co-extrusion is inferior to monolayer is most commonly due to mistaking co-extrusion for lamination (this topic is covered next). The second most common reason for such false claims is from factories hesitant to make the significant capital investment required for specialty extruders and custom profile tooling, or those in "technology denial," or trying to postpone the inevitable by defaming advanced technologies. Won't a co-extruded product delaminate? Some falsely claim that co-extruded layers may delaminate (separate). Co-extrusions CANNOT delaminate because co-extrusion is a MOLECULAR bonding process, without the use of adhesives. This is done at temperatures near melting points, at high pressure, in a sealed environment where no moisture or air can be entrapped to compromise the molecular bonding. Conversely, lamination is a process whereby adhesives are used to bond layers together. Only LAMINATIONS can, and do, delaminate. How is vinyl fence put together? Most assembly of vinyl fencing is done by locking the rails into posts, using rails that are tabbed with a special tabber, or flanging tool, called a notcher. Depending upon the style of fence, different fasteners can be implemented. When screws are required for weight-bearing gate hinges, they are screwed into internal metal support structures, "sandwiching" the vinyl for added strength. Will a Southwest Vinyl fence mildew? Mildew feeds off of organic materials like wood. High Density Vinyl Polymer is non-organic and does not support mildew. Unlike porous materials such as brick, block, or wood, SW Vinyl fence profiles have a very smooth, high-gloss, non-porous, non-chalking surface. Dense vinyl polymer, infused with TiO2 (titanium dioxide), helps to prevent mildew by making it difficult for organic materials to attach. A consistently damp and dirty surface can provide enough material for mildew to get a start, but a mild solution of bleach and water should easily remove it. Does Southwest Vinyl Fence chalk? Chalking is a term used for describing the deterioration of vinyl surfaces, especially older types of vinyl. Exposed titanium dioxide particles (TiO2) would appear as a white powder which could be wiped off the surface. SW Vinyl's use of high grade, non-chalking, TiO2 ensures that there will be virtually no chalking of product surfaces. All vinyl fencing will "technically" chalk sooner or later, but with the superior protection capabilities of sufficient TiO2, this is usually not detectable. SW Vinyl's product lines are formulated for exceptional beauty over a lifetime. Can I paint my vinyl fence? Southwest Vinyl's products are engineered to retain their beauty and good looks for life, without painting or maintenance. 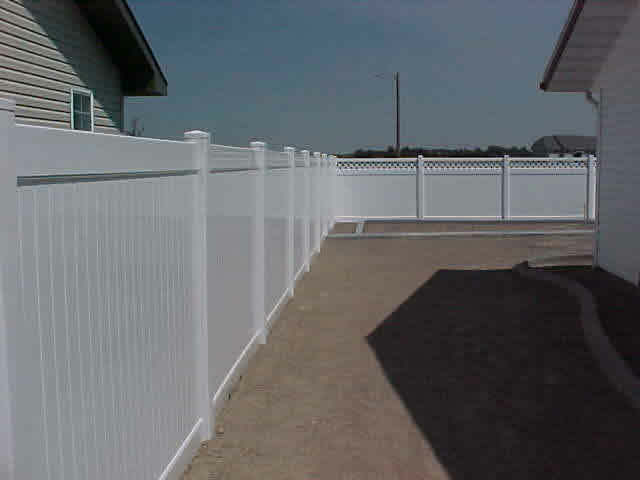 SW Vinyl Fence does not recommend painting vinyl products. Although there are "vinyl" paints available, painting or otherwise altering the surfaces of the product lines SW Vinyl carries will typically void the lifetime warranty. How does the cost of vinyl fencing compare with traditional fences? Masonry: Vinyl costs less than unsightly cinderblock in most parts of the country. In addition, no cinder block manufacturer will warranty brick or block as both will eventually crack, erode, and lose their mortar over time. Masonry eventually has to be replaced at high cost. Also, when graffiti is painted over, a wall becomes an expensive, high-maintenance, nuisance cycle--continually trying to match paint lots and finishes. Metal: Aside from the initial high cost of metal fencing, such as wrought iron or pro-panel, the advantage of NOT having to continuously treat, peel, sandblast, prime, apply multiple coats of paint, and eventually replace your fence goes without saying. Wood: The initial cost of vinyl when compared to wood is slightly higher for material in most regions of the country. However, with the ever-increasing cost of wood, this difference is becoming a non-issue. When all of the cost factors are taken into account over the life of your fence, LIFETIME VINYL is the true money saver. The higher cost of wood includes having to routinely replace warped or broken wood pickets, yearly maintenance costs for paint, stain, waterproofing, labor, etc., AND replacement of the entire fence every decade or two. When the detrimental environmental effects of wood processing are considered, along with the toxic chemicals needed to maintain wood, it becomes clear why so many states encourage high-density Vinyl Polymer as THE green fencing solution. Wood is not as cost effective as it might first appear, and some costs are hard to measure; such as the loss of property value when a fence is in need of repair or painting. The initial cost difference between vinyl and any other kind of fence vanishes in a short time, and, in fact, LIFETIME VINYL becomes THE most sound and financially viable fencing option. Once your SW Vinyl fence is installed, you'll never again have to bother with waterproofing, treating, stripping or painting. No more rusty nails, chipping, cracking, or replacing rotted or warped boards. Say goodbye to splinters, knotholes, mold and insect damage. Will my vinyl fence turn yellow? Southwest Vinyl Fence manufacturers use only superior, durable grades of non-chalking TiO2, protecting the vinyl from the harmful effects of the sun's UV rays. As long as your fence is kept clean, with a periodic rinse from a garden hose, any fading or discoloration will be slight and uniform--much like kitchen linoleum fading that is only noticeable when the cabinets are torn out for a remodel. What effects does my vinyl fence have on our environment? Modern High Density Vinyl Polymer fencing products are safe and non-toxic. They do not breakdown and release harmful chemicals into the ground and or require toxic chemicals for their maintenance; such as stains, oils, waterproofing, paint, and thinner. Trees are spared with the use of a vinyl fence. Because of the exceptionally long life of high-quality vinyl polymer, one "Lifetime" vinyl fence will typically outlast anywhere from four to six wood fences. In addition to saving wood, and money, if a SW Vinyl fence ever needs to be taken down it can be recycled into other products such as hoses, watering cans, road barriers, etc. This is the term used for vinyl product that does not contain recycled material. Recycled products that may be imported into an extrusion plant may contain impurities or lower grade vinyl which can seriously affect the finished product's resilience, impact resistance and UV inhibition. SW Vinyl purchases from manufacturers who extrude with virgin vinyl materials. Can a vinyl fence break? Windload Calculations: Mathematical calculations that determine if a style of fence can withstand a particular wind velocity without failure. SW Vinyl Fences can be constructed to withstand 120+ MPH microbursts with optional metal internal post and rail reinforcements. PVC or uPVC: Polyvinyl Chloride. Can refer to the resin used in Vinyl production, or can refer to the finished product itself, including additives. High Density Vinyl Polymer is a highly advanced type of PVC, such as the types used in vehicles and body armor. The term uPVC refers to Ultra-Violet (UV) protected PVC. All PVC used in the manufacture of exterior products by reputable manufacturers is UV - inhibited, or, uPVC. Resin: The base material used in the production of materials. For Vinyl fences, High Density Vinyl Polymer resin is used. There are several grades and several qualities of PVC Resin. For example, there is high-quality Siding Grade Resin, and low-quality Pipe Grade Resin. Different manufacturers have varying qualities and consistencies of resin. TiO2: Titanium DiOxide. This is the most common ingredient used for Ultra Violet ray protection. TiO2 is a white pigment that reacts with Water and Oxygen. Water, or moisture in the air is necessary for this product to do its job effectively. There are at least 2 grades of TiO2: Uncoated, or Chalking Grade, and Coated, Durable or Non-Chalking Grade. The primary difference, apart from the higher cost of the non-chalking grade, is that it will chalk at a much slower rate, providing a more lustrous finish for a longer period of time. It is interesting to note that many manufacturers suggest periodic watering of newly installed vinyl fences in desert climates for the first few months, as this will help strengthen molecular bonding of TiO2 and resins.